Review by AllTheBestFights.com: 2016-04-01, pretty good fight but with a disappointing finish: Adrien Broner vs Ashley Theophane gets three stars. The former world champion in four different weight classes Adrien Broner entered this fight with a boxing record of 31-2-0 (23 knockouts) and he is ranked as the No.10 welterweight in the world. He fought three times last year defeating John Molina Jr (=Broner vs Molina) and Khabib Allakhverdiev (=Broner vs Allakhverdiev) but between these two bouts he lost to Shawn Porter (=Broner vs Porter). His opponent, Ashley Theophane, has an official record of 39-6-1 (11 knockouts) and he entered as the No.47 super lightweight. He suffered his last loss when he faced Pablo Cesar Cano in 2013 (by split decision, Cano vs Theophane), after this bout he has won six consecutive fights beating Steve Upsher Chambers in his last one. 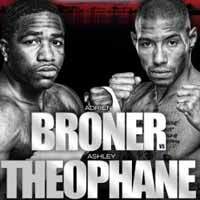 Broner vs Theophane is valid for the vacant WBA World super lightweight title but Broner failed to make weight so the title is at stake only for Theophane. Watch the video and rate this fight!